Posted in Climate Change and tagged Bangalore, British Council, British Council India, British Minister for Energy and Climate Change, British Prime Minister, Climate Change, Digu Aruchamy, Green Initiatives Department, Hotel Leela Palace, Infosys, International Climate Champion, Mr. David Cameron, Mr. Gregory Barker, UK Minister, Water Resource Management on August 17, 2010 by British Council India. 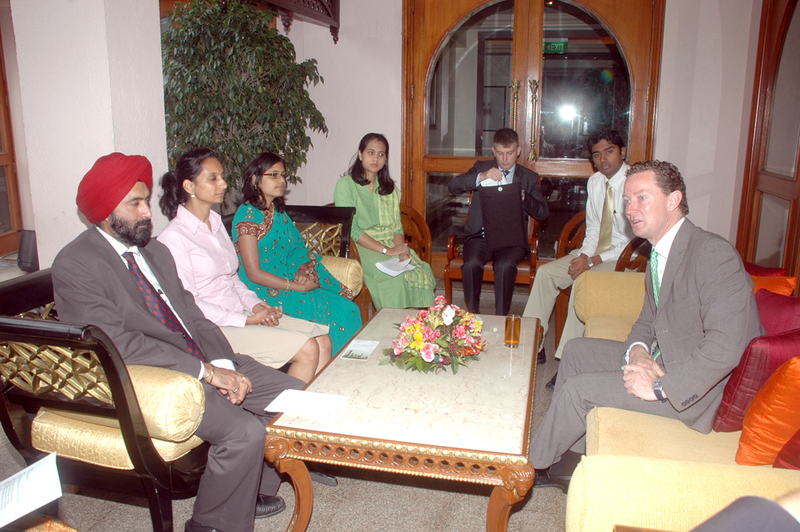 28th July 2010 was a very memorable day for me as I got to meet and interact with the British Minister for Energy and Climate Change, Mr. Gregory Barker and also got an opportunity to share the stage with British Prime Minister, Mr. David Cameron while he was delivering his speech at Infosys technologies limited in Bangalore. The meeting with Mr. Barker was at Hotel Leela Palace in Bangalore (one of the best hotels in the city) at 8.30 am and I was very excited as this was my first meeting with a minister from a developed country. My only other experience of meeting a politician from Europe was in Stuttgart, Germany when we went to present the youth declaration of the UNESCO World youth congress to the Mayor of Stuttgart in August last year. That meeting went on really well and it was really heartening to see the depth of knowledge and warmth in him. I reached the hotel really early around 7.30 am (it was a rainy day and it gets pretty chilly in Bangalore) and met with other participants who were from the civil society and Business community in Bangalore. The group was very diverse with representatives from various organizations like Greenpeace India, Alliance to Energy Efficient Economy, ATREE and HSBC. Hita Unnikrishnan, my fellow ICC and Anu Thampi who is the ICC coordinator for India and Srilanka were also part of the group. After an amazing breakfast we took our seats at the meeting table and waited for the Minister to arrive. The Minister arrived exactly at 8.30 am (This is a rarity in India as most of the time we get really frustrated waiting for our politicians) and took his seat at the table. I was doubly impressed as he was pretty young for a Minister and it is my strong belief that Climate Change is an issue that can be better understood and addressed by a younger politician. After a quick round of introduction, I was given the opportunity to set the context for the meeting with respect to climate change in India and the challenges and opportunities associated with it. I was little nervous as I was the youngest in the group but I was pretty confident that I will speak well. I opened the debate by stressing upon the fact that how India is in a vulnerable state and needs to take drastic steps to address the issue of climate change. India with a majority rural population dependent on rain fed agriculture; the largest population in the world below poverty line; a burgeoning population which is fast depleting the natural resources of the country; a long coastline of close to 6000 km will be seriously impacted by climate change. Our Economic growth of nearly 9% year on year is incredible but the question is how long we can sustain this growth if we don’t take measures to conserve our natural wealth which is fuelling this amazing growth in the first place. I also mentioned that climate change is not only a major issue but is also an incredible opportunity for us to rethink the current path of development and steer India on the course of sustainable development and make it a leader in sustainability. Traditionally, India has been a sustainable society but after post-liberalization, consumerism has over taken over the lives of our fast growing population and has steered India to the current path of unsustainable development which is not sustainable in the long run. But all is not grim about climate change in India, there is also a concerted effort from the Indian government, civil society and private organizations to address it and make sustainability an important component of our developmental program. The Minister was also pretty pleased knowing that there is large section of young people in India who are actively working to improve climate change awareness among the civil society and working with various sections to put pressure on our government to take action on climate change. The Minister made a very important statement that his government led by Mr. Cameron will be greenest government in the history of Britain and will be actively involved with India and other developing countries in aiding technology and financial resource transfer, thereby helping them to reduce the impact of climate change and move towards a sustainable path of development. He was also very curious to know about how the Indian society in general thinks about climate change especially when the majority of population is struggling to meet their ends meet. We told him that the irony about climate change debate in India is that the people who are least responsible for it are going to be the most affected by it. Hence there is a great urgency to make them aware and help them cope with its impacts. We also had a good discussion about energy scenario in India and the Minister agreed with our opinion that decentralized form of energy through solar and micro wind is the only way for a country like India to attain complete electrification and he promised that he will discuss the same with our Minister for Environment, Mr. Jairam Ramesh when he meets him in New Delhi. There was also a discussion about how India can leverage on its immense pool of technical talent, esp. Information Technology to come up with climate change mitigation and adaptation solutions for the world. The other group members also shared their experiences in working with climate change issues in India like renewable energy, biodiversity conservation, public awareness etc. The minister also shared his views on smart grids and how it can revolutionize the energy sector and reduce the transmission and distribution losses in the grid esp. for a large country like India. The meeting lasted for 45 minutes and I was very happy with the way the meeting went and I am pretty sure that the Minister was pretty pleased with his first meeting in India. After the meeting, I went to Infosys Technologies Limited where I work in their Green Initiatives team. 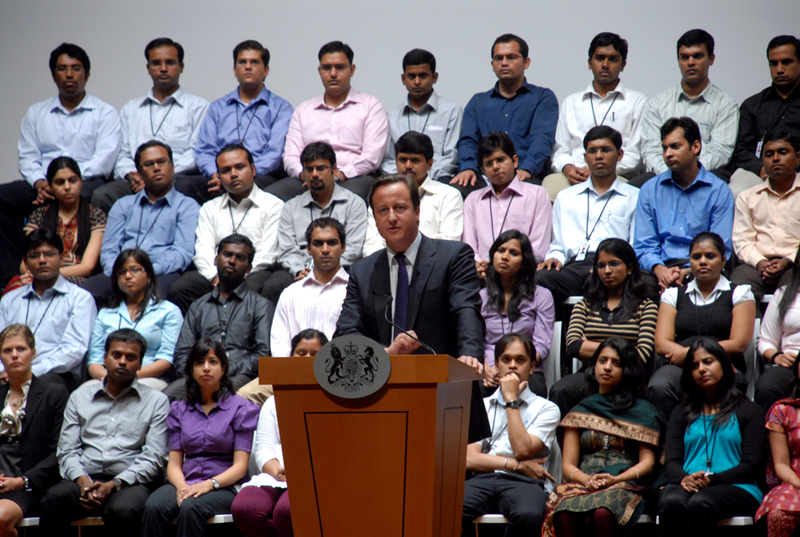 I work at the same campus where British PM was visiting to deliver his first state address in India. As luck would have it, I was selected to be seated on the stage during the PM’s address. About 64 Infosys employees were selected to be the backdrop when the prime minister delivered his speech in our convocation center. When we enquired the reason for this arrangement, our organizing team explained that since the PM’s address will be telecast live across the world, they wanted to project the new face of India and thus I ended up becoming a part of the young India, full of confidence and passion ready to take India to a new path of development. The PM’s speech was extremely good and I thoroughly enjoyed the experience of sharing the stage with him. This day proved to be an unforgettable day for me and I would like to sincere thank the British High Commission and British Council for this wonderful opportunity. This has given me a lot of motivation to continue my efforts as an International Climate Champion and encourage more young people to start realizing the importance of taking part in the climate movement as “It is our future which is at stake”… Let’s work together to secure our future!!! hi digu,Hats off !!!! wat u spoken in big official meeting,its really great…I hope ur speech il motivate more young pupils as well as they il start action towards climate change…..